Will has lost the promise of the sky. But the sky has fallen on Will. A U.S. Army veteran haunted by memories and losses, he bears burdens that he does not — perhaps cannot — express. 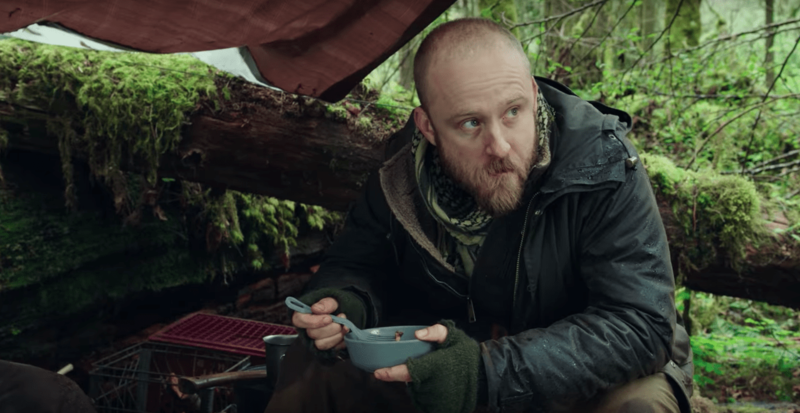 Throughout Debra Granik’s new film Leave No Trace, we can only guess the horrors Will has witnessed, what grim tasks he has seen through, what griefs he carries. We’re also left with questions about what happened to his wife, the mother of Tom, his 13-year-old daughter; we only know that she’s been gone long enough to leave young Tom with faint, impressionistic memories. Tom (Thomasin Harcourt McKenzie) and Will (Ben Foster) try to go unnoticed. And it’s worse than that for Will: Whatever betrayals he has suffered, he has lost his belief in America, lost his capacity for compromising and coping with its corrupt and increasingly oppressive form of capitalism. He has come home to a country he finds threatening. So he does what he knows how to do: survive. Hiding in a forest park just outside of Portland, Oregon, Will raises his daughter and teaches her to read, write, and think outside of culture’s box of conformity. They survive on high-protein rations, drinking (and showering in) captured rainwater, and packing themselves in blankets and moss to survive cold nights. They make the most what very little they carry. And they practice hasty evacuations in case a wayward runner, hiker, or park ranger stumbles onto their carefully concealed shelter. Like soldiers surviving in faraway jungles, they do what they can to complete their daily missions and manage their uncertainties. Although actor Ben Foster (Hell or High Water, Hostiles) is completely convincing as a character who is only at home beyond the influence of civilization, it isn’t Will’s countercultural convictions that capturesmy imagination here — not at first, anyway. That’s a rather familiar conceit. Just in the past few years, I’ve seen several films that explore similar ideas: The Kings of Summer, Captain Fantastic, and Hunt for the Wilderpeople — to name a few. The film’s sense of place, however, is powerfully authentic and, for me, familiar. I’ve lived my whole life in the grey-skied, green-forested territories of the Pacific Northwest, and hiked many a trail through rainy forests. These towering evergreens, morning mists, abundant ferns, and immersive birdsong feel just right. (This is a good year for exploring Northwest woods on the big screen. When it comes to your town later this year, be sure to see Prospect, a thrilling sci-fi adventure filmed in Pacific Northwest forests.) Leave No Trace immerses us in rugged and rain-saturated terrain, where it is easy to get lost and even easier to get into trouble. 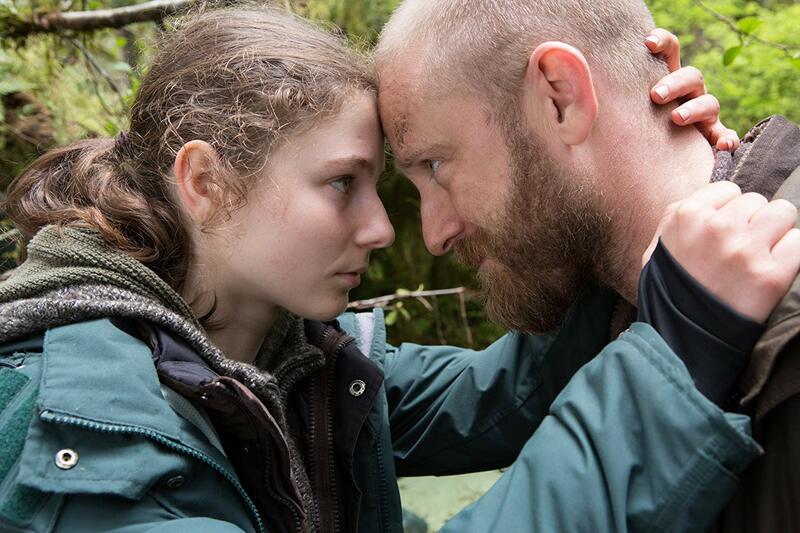 Leave No Trace: A persuasive, poignant portrait of a father and daughter. It shouldn’t surprise anyone that this territory is brought to us so convincingly by filmmaker Debra Granik. Her sensational feature-film debut Winter’s Bone was a revelation in its observant and patient exploration of Ozark Mountain communities that live outside the radar of city-dwellers. That film also unleashed a force called Jennifer Lawrence upon the world. It’s been several years since Winter’s Bone won critical acclaim, and that makes sense as I watch Leave No Trace: Granik and her Winter’s Bone co-writer Anne Rosselini have taken their time, lavishing love and care on this film, and clearly becoming well-acquainted with off-road areas in the Pacific Northwest, places people go to get lost. They’ve read Peter Rock’s novel My Abandonment, studied the circumstances of the true story that inspired it, and collaborated to create a lean, soft-spoken feature in which more is said in the anxious glances exchanged by Will and Tom than in their dialogue. 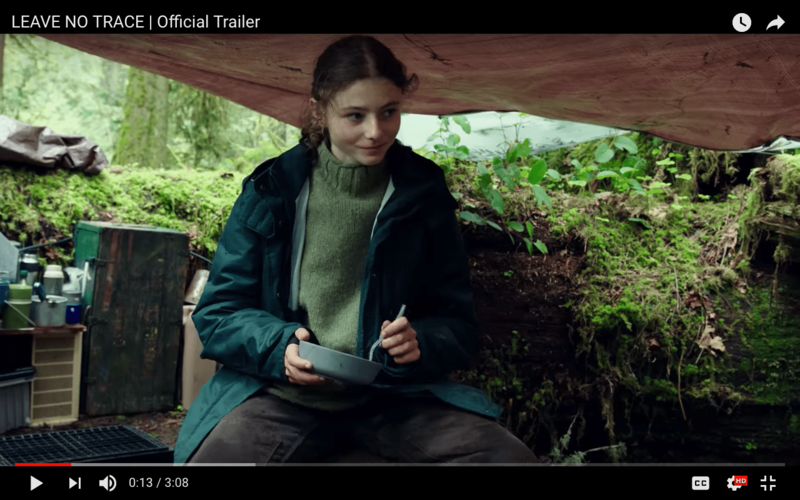 Playing Will’s fearful, trusting, and trapped young daughter, Thomasin Harcourt McKenzie is the obvious highlight of Leave No Trace. She deserves all of the praise she gets: She’s remarkable in how she conveys Tom’s conflicted and evolving senses of love for, fear of, and skepticism about her misguided father. Tom seems at times like a baby bird thrown from the next into a hostile environment, terrified and vulnerable. At other times, she is angry about things she does not have the vocabulary or experience to describe; a sense that strangers who look on her with dismay and pity are probably right to do so; a sense that she is being deprived of things that any girl her age needs. And, in time, we see her finding courage to argue with her father, to trust her instincts, and, most remarkably, show compassion for her father in his condition of fear and fracture. Survivor-in-training: Thomasin Harcourt McKenzie as Tom. The lesson that Will most wants to teach her in the midst of consumer culture’s seductions and manipulations is simple but challenging: “We can still think our own thoughts.” The unnerving question at the heart of the film, though, is whether or now Will can, in the end, allow Tom to have thoughts of her own about how to survive, what compromises to strike, and whether to engage the world around them or withdraw. For most audiences, the energy in this film that will capture and inspire them is Tom’s, as she wakes up to “her own thoughts” and weighs the risks of acting on them. But for me, the center of gravity in Leave No Trace is not in Tom’s awakening discernment, but in Will’s increasing awareness that he is a prisoner of his experiences. For all of his bold (and, in my opinion, justified) critiques of contemporary capitalism — which remind me of Allie Fox, the half-mad prophet of Peter Weir’s The Mosquito Coast — Will exposes, at times, a sense of helplessness and grief, a knowledge that he has lost the way back to balance and wisdom. He knows that his daughter’s well-being depends on her progress in finding her own way, but he dreads the loneliness of losing her. Tom is his only comfort and companionship as they move like vulnerable rabbits in a world of predators, betrayed by all that they should have bee able to rely on. Haunted by losses: Ben Foster as Will. Will cannot watch television, probably because he knows the prevalence of political lies and media manipulation, how human lives are sacrificed on the altars of misguided wars. He does not trust social services, perhaps because they took his wife from him. (The true story that inspired the novel focused on a veteran whose wife had been institutionalized, but Granik’s film leaves the fate of Will’s wife unclear.) And he is uncomfortable outside of the shelter of the trees. There is something to the forest here. Granik’s movie is not particularly interested in it — this isn’t a Terrence Malick reverie about the glory of the natural world. The camera is not distracted by the natural beauty of its contexts. These environments are purely practical for Will and Tom, a way to hide from culture, from influence, from interference. At first, this bothered me. As someone who finds the Pacific Northwest to be a place alive with mystery and spirit, I find myself wanting films that capture that. But I realized later how that approach would have been a distraction. Leave No Trace is not about this particular wilderness. Will’s existence in the forest isn’t about loving its beautiful mysteries. For us to understand him, we need to experience how these environments are indifferent to human life, begrudgingly offering up resources, and quick to turn against their fragile inhabitants. We need to understand that Will prefers this to the other wilderness of American culture. He is only content when he free, unmonitored, and unreachable in the woods. When he’s out in the open, away from the risks he recognizes and understands, he looks trapped. 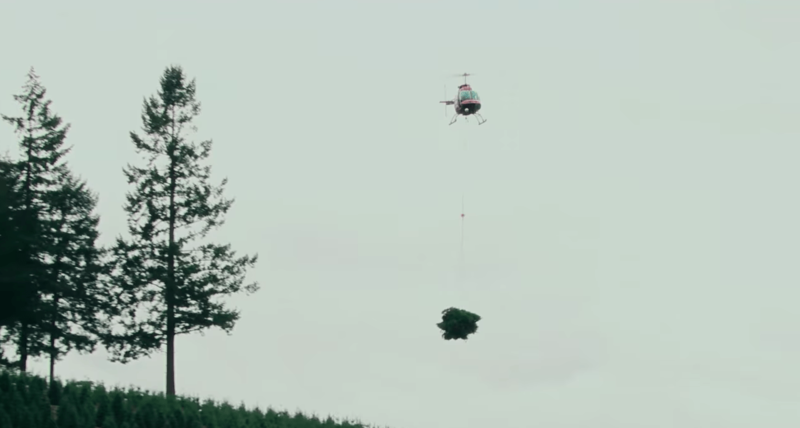 In what was for me the film’s most revealing moment, we see Will working on a tree farm, loading freshly cut evergreens into trucks for sale faraway as Christmas trees. A helicopter moves in, and suddenly Will cowers, wrapping his arms around his head. That thunderous sound from the sky is our only clue, but the suggestiveness of the moment is hard to miss: He seems haunted by that specific experience of soldiering on in the shadow of massive machines, perhaps a participant in cutting lives short, perhaps witnessing casualties and lives being lifted and carried away. The forests outside of Portland: a wilderness of wonders, a resource to be harvested. Perhaps I’m reading too much into this, but I don’t think so. It makes so much sense. In that moment, I don’t need more details or historical context. And Granik, thankfully, avoids unnecessary flashbacks and expository detail. (In this, she reminds me of David Lynch, who showed similarly effective restraint in The Straight Story; that film asks actor Richard Farnsworth to play a similar scene of PTSD, when wartime memories ambush and burden him.) I have what I need from this small but powerful scene to feel a strong emotional connection with Will, and to feel empathy for him the rest of the way. Like so many — maybe you, too — I experienced the terrorist attacks on America in September 2001 through the constant replaying of horrific images and sounds on television. Almost anyone old enough to recall that world-changing day can talk about emotional scars. But for me, there was an added sense of surreality. Since childhood, I had suffered nightmares of looking out at a downtown skyline and watching a Boeing 747 descend upon the city and smash into skyscrapers in a fiery cataclysm. So, waking up into sounds of panic and calamity from my clock radio’s local news station, and realizing that I was not dreaming, that the nightmare was real this time… I lost something. I lost the joy I’d once found in the sight of skyscraper, in the experience of looking up at the reflections of clouds and sunlight among towers of glass. I lost my sense that my bad dreams were irrational and not to be taken seriously. At the time of the attacks, I worked in downtown Seattle, walking in the shadow of skyscrapers every morning, lunch hour, and late afternoon. My window-facing desk on the 20th floor gave me a clear view of airplanes ascending from SeaTac airport and from Boeing Field, airplanes flying directly toward me. I had always enjoyed the view, but in the years after the attacks, I felt an ache in my stomach every time I noticed an airplane flying toward downtown. Was it ascending properly, or was it unnervingly low? I knew that the odds against a similar attack made worrying irrational, but I felt sick anyway — a mix of dread that it would happen again, somewhere, someday, and grief for the loss of a world in which the sight of a passenger planes emerging from and disappearing into clouds had inspired awe and even joy. And even now, almost 20 years later, I feel a faint pulse of dread when I hear the rumble of a jumbo jet’s engines reverberating through the city. I want to take cover, to get underground, to escape. Similarly, I have recently lost the sense of possibility and joyful surprise that characterized the first 15 years of my relationship with social media. I used to look forward to signing on in the morning to see messages from friends around the world; to see what was making friends laugh; to read about exciting new developments in science, sports, and art. Now, I approach digital devices with a sense of dread, knowing that I will be almost certainly see painful headlines that will weigh on me for the rest of the day. More and more, the world makes me want to withdraw, like Will, into a wilderness somewhere. It makes me want to cut all cords to a dehumanizing culture. I’m tired of being tracked, monitored, and pursued. I’m tired of sales pitches. I want to think my own thoughts. I want to pack the car and disappear. But that is not a road that leads into hope or freedom. And that is why the final moments of Leave No Trace are both hopeful and devastating at the same time, representing two possible futures. One is a path further up and further into suffering and struggle, a burden that we must bear with difficulty, humility, and gratitude in order to love one another and sustain hope. The other is a path of retreat, of desertion. That path tends to be chosen by those who have been crushed by crises, their trust betrayed too many times. They march on a relentless search for peace. Their lives are laments — evidence of a world broken beyond our capacity to repair it. 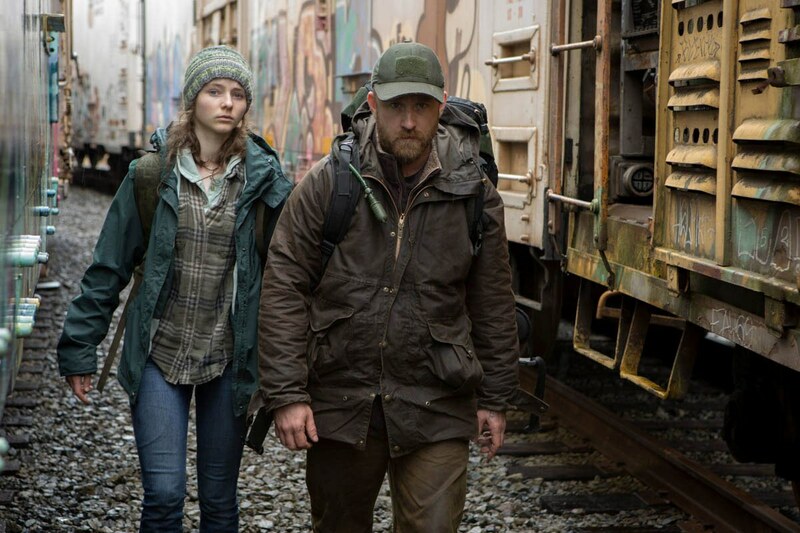 Leave No Trace might ultimately be most powerful not as a story about fathers and daughters, not as a survivalists’ adventure, but as an invitation to pray for and love those whose sufferings have driven them out of reach, those whose skies have fallen. Dreaming of making a movie?